Greetings from a very happy CTVegFest speaker! The festival was a great weekend filled with exhibitors, raffles, cooking demonstrations and speakers. 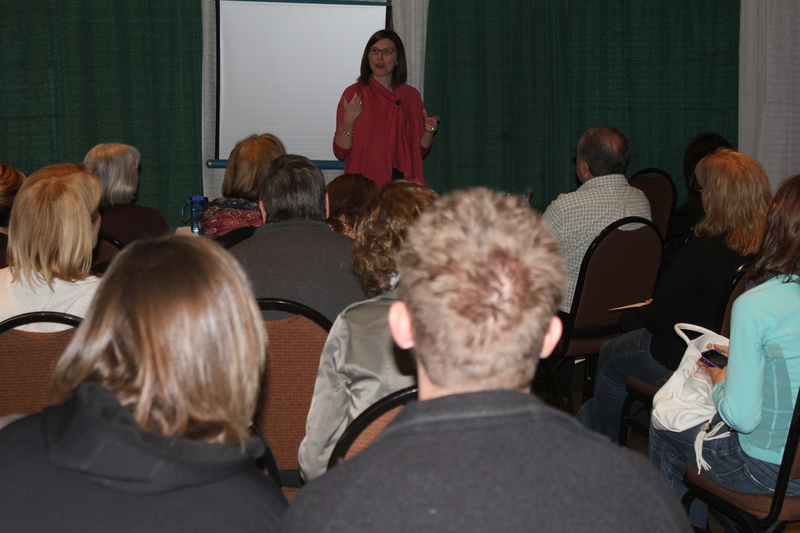 I spoke on Sunday, April 29 all about natural sweeteners. About 30 people joined the discussion “Being Naturally Sweet: The Costs and Benefits of a Refined Sugar-Free Diet.” When I polled the audience, I was quite impressed that the majority were already trying to limit the amount of refined sugars that they consume. I first talked about how I learned that I had food sensitivities, and that by listening to my body and consulting a second physician’s opinion really started me on the right path to adjusting my diet. We discussed how tricky it is to remove sugars from one’s diet, and the possible code words for “sugar” in an ingredient list – including, but not limited to, the following – dextrin, dextrose, glucose, saccharose, sucrose, and some syrups and sweeteners. By looking at cost comparisons we all agreed that the relative low expense of cane sugar is why it is the sweetener of choice for many food manufacturers – it’s just less expensive to make foods sweetened with cane sugar than with a natural sweetener. Yet do not despair! Even though I cannot have cane sugar, and choose to limit the amount of other refined sugars that I consume, desserts can still be enjoyed! We talked about how to substitute with natural sweeteners using sweet conversions. The question did arise about liquid versus solid sweeteners – I have not found any trouble with substituting liquid alternatives like agave nectar, honey and maple syrup instead of using granulated sugar in baked goods such as cookies, cakes and brownies. For puddings, however, I sometimes have to use a little cornstarch for its thickening properties. The benefits of natural sweeteners are many – so that’s why many of us at the CTVegFest aim to be naturally sweet. I enjoyed discussing my journey so far with the audience, and I intend to continue the discussion right here on this blog. So thank you for hearing me speak, reading my blog posts, commenting with questions and ideas – it’s wonderful to be part of a supportive community. At the close of my speech I asked everyone to answer a short survey. Since I am an economist, I just love to collect data! I now have the results prepared for you. The survey consisted of three questions involving rating favorite desserts, naming a favorite dessert flavor, and listing a favorite food. Thirty-one people answered the survey. 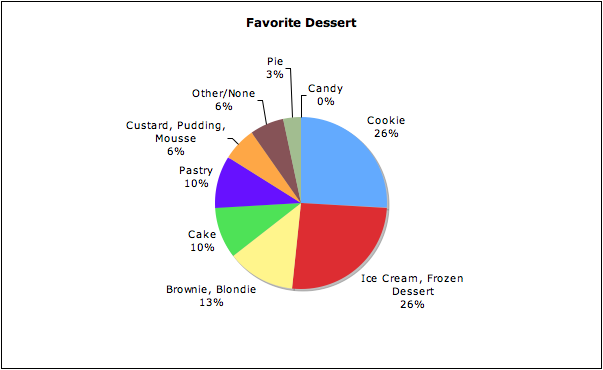 The results of the favorite dessert choices are shown in this pie chart. As for first choice selections, the group was evenly split between cookies and ice cream. However, if the first, second and third choices are included, ice cream slightly edges out cookies. When asked to list a favorite dessert flavor, the choice is overwhelmingly chocolate! Twenty-three of the respondents selected chocolate as their favorite dessert. I am certainly not surprised by that result! Vanilla was a distant second with three responses, and cinnamon came in third with two mentions. And what were the respondents’ favorite foods? The answers ranged from green smoothies to pasta, and from filet mignon to chickpeas. However, eight of the responses involved seafood. Yum! Would you like to provide your dessert preference? Please do in my first poll! All you have to do is click on which dessert category is your favorite and then click on “vote.” It will be interesting to see if the results are the same as or differ from the CTVegFest audience. The poll will be available on the front page of my blog for the rest of the month, and then we can check the answers. Thanks again to all of you who participated in the CTVegFest! And thanks for taking my dessert poll! This entry was posted in Economics, Organic on a Budget, Sensitivity Lingo and tagged Cane sugar free, CTVegFest, Economics, Natural sweeteners. Bookmark the permalink. The CTVegFest was great. Thank you so much for speaking. Honey is my favorite ‘healthy’ sweetener. The CTVegFest was great. Thank you so much for speaking. Honey is my favorite ‘healthy’ sweetener. I haven’t used it too much as a substitution in recipes yet though.